THEN IT RAINED COMICS PRESENTS. 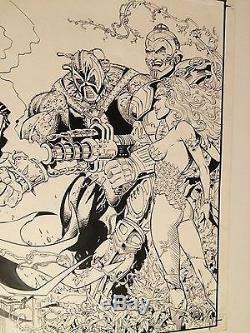 WIZARD #12 original COVER art POISON IVY BATMAN BANE - SIGNED, STUNNING, 1997. Great thrills highlights this must have piece of COVER ART........ From 1997 this is the ORIGINAL COVER ART to WIZARD MAGAZINE #12, a south american version!! 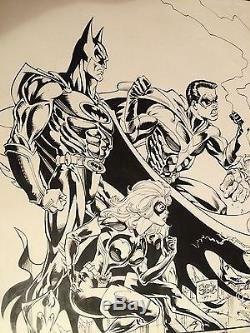 SIGNED IN THE TOP RIGHT by the ARTIST - SERGIO CARIELLO..... 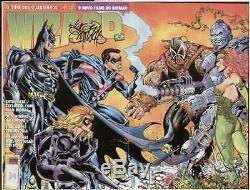 This awsome image features BATMAN, NIGHTWING, BANE, POISON IVY and more!!!!!! A STUNNING SHOWPIECE --- Approx size is a LARGE 17 by 22!! GET THIS GREAT PIECE OF ORIGINAL ART WHILE YOU CAN!!! A super cool piece for any collection!!! I HAVE SHOWN A PICTURE OF THE WIZARD MAGAZINE THIS IS FROM---YOU DO NOT GET THE MAGAZINE!!!!! GET GREAT SERVICE - WELL PACKED ITEMS. Let us know why and maybe we can work it out!!! Helped with market reports as a WIZARD V. And are known by comic dealers and collectors worldwide to be FAIR and HONEST!! The item "WIZARD #12 original COVER art POISON IVY BATMAN BANE SIGNED, STUNNING, 1997" is in sale since Thursday, June 08, 2017. 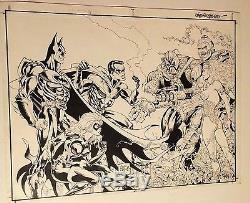 This item is in the category "Collectibles\Comics\Original Comic Art\Covers".az" and is located in Scottsdale, Arizona. This item can be shipped to United States.